Yesterday, a couple of hours after I saw the doe and her two fawns, Danny asked to go out. It was about twilight. During the day I let Danny go outside with us without a leash–unless we are near the road. However, toward evening I use the leash because I don’t want to risk him running off after deer or other evening/night animals. While Danny was “doing his business” I heard a snort. I looked down the driveway and saw the Mama Deer staring at me. She took a step toward me and snorted again. Another step and another snort. I thought, “Wow, she’s going to come after me because she thinks I’m threatening her little ones!” I didn’t want to upset her so as soon as Danny was done, I got him back in the house. I love the deer on our property! Early this afternoon I was going to take Danny with me to get the mail. I started to run down the driveway, expecting Danny to run along side me. I looked back to see where he was and there he was standing at the top of the hill looking at me. “Com’on, Danny!” I called. But he just stood there grinning and wagging his tail, letting me know quite plainly that he was not going to go down that hill. So I turned around and trudged back up. He danced around me with joy when I reached the top. “You are such a wimp,” I told him fondly as I let him in the house. I went alone to the mailbox. Later in the evening, JJ wanted to walk so we went to the mailbox and back. He wanted to run up the driveway but though I tried, I was just too tired. I walked up instead. JJ didn’t have to work today so after his Dad left for work, he and I ran a few errands. We stopped at the lumber yard to get another gallon of paint. We actually decided that the color we had chosen before had too much of a greenish tint to it so, since we needed more paint anyway, we chose a very similar color that was more yellow. The differences between the colors were so slight that it’s barely noticeable–and yet it is. The other color felt slightly wrong. I think it’s difficult to choose paint because colors can look right in the store but not on the walls. I like the creamier color better. I painted again today. I should be able to finish the living room tomorrow and then I can begin working on the kitchen. I’m also considering colors to paint the master bedroom and JJ’s room. Since writing yesterday’s post, I have been thinking a lot about boundaries and how difficult it is to set them. I think that people who can set boundaries would think it was utterly ridiculous how difficult it is for others to set them. It’s kind of hard to explain, although I can see where it began. I mean, I remember wanting to confront a sister about this or that when I was a child, and my Mother telling me, “She is who she is. Love and accept her for who she is. Don’t rock the boat. You’ll only make things worse.” That advice sounded loving and since I wanted to be loving and accepting, I didn’t confront my sister. In reality, the advice was not loving, it was unhealthy because issues were not resolved. When resentments and offenses built up among siblings to the point where they were voiced, it felt like a brutal attack–which only supported my Mom’s opinion that confronting would make things worse. So you learn to accept the offenses, be silent, smile, and be nice. As adults, I was still accepting, loving, and nonconfronting, which allowed my sister to continue abusive behavior. When I did finally set a boundary, our relationship ended. That happens sometimes. Either a person respects a boundary or the relationship ends. There were also the message that my Mom taught and others throughout my life reinforced that to say no, to set limits, to want something for yourself was selfish. So, again, you learn to be nice, don’t rock the boat, and give and give and give to others without expecting anything in return. It’s good to be compassionate, forgiving, and giving, but abusers or other types of “takers” will take and take and take until there’s nothing left to give. These messages make it difficult to set boundaries, and sometimes the boundaries that are difficult to set are ridiculous. Like a few years ago, I had a terrible rash. A friend asked a mutual friend to drop off some medication that she thought would help. The friend dropped off the medication and then asked to be taken on a tour through my garden. I was completely unable to tell the friend that the rash was so unbearable that I hadn’t slept in days and the last thing I wanted to do was take her through my garden. Instead, we walked through my garden. Now I realize that there was nothing rude or “not nice” about telling her that the tour would have to wait until I felt better. Duh. But I didn’t know it then. A few years ago, our neighbors and their visitors kept parking on our lawn. They didn’t park a little bit on our grass, but they pulled up right on our lawn between the street and the sidewalk. EJ and I really struggled with it and agonized over it for several months because we would never park on someone’s lawn. (Our other neighbors have a strip of pavement along their yard that our visitors sometimes mistake as the side of the road. It’s not, our neighbors pave and maintain that bit themselves. We always told our visitors that that is our neighbor’s property and please don’t park there). We didn’t want to rock the boat or make things worse by asking our neighbors to please not park in our yard. I had been learning about boundaries so finally when I saw one of their friends park on our lawn, I opened the window and asked if they would please not do it. It took all my courage. They said ok, moved their car, and no one parked there again. Wow. No attack. It’s sort of stupid to agonize over it. I knew that I grown much when a few weeks ago, just before I moved north, our neighbor was out cutting down branches from a tree that was close to our fence. They were doing it right…with a rope around the branches they were cutting so that they wouldn’t fall to the ground. When previous neighbors had had professionals trim the tree, a branch had fallen on the fence and bent it. (We had said nothing and they didn’t fix it.) I was sort of expecting a branch to fall on our fence again this time. Sure enough, I heard a big KABOOM, looked out, and a huge branch (more like a trunk) had fallen and completely crushed a section of our fence. Without even agonizing over it, I walked out to talk to the neighbors. “Oops! We are so sorry!” our neighbors said when they saw me approach. “It was an accident. We were lowering the branch when it bounced and hit your fence.” I said, “But you are going to fix it, right?” They said they would. So I went back into the house and a little bit later one of the guys came to get me. They had straightened and fixed the fence and wanted me to approve it, which I thought was nice. I went out and looked at it and it was better than it was before. I thanked them, they apologized again, and everything was pleasant. Wow. I had actually spoken up and things were not “worse” because I did. I never really understood healthy boundaries until I began to understand emotional abuse. In the past, I have felt that being accepting (of flaws), forgiving (without repentance), sacrificing and giving (without conditions or limits) meant that I was being compassionate, merciful, and “godly.” However, now I understand that being “too nice” can actually allow disrespect and abuse to continue and grow. If people have the tendency to be “takers” or abusers, they don’t see a person without boundaries as compassionate and caring, they see them as weak doormats whom they can control, manipulate, and take advantage of. Maybe that’s why the Bible says “Don’t cheat your neighbor by moving the ancient boundary markers set up by previous generations.” (Prov. 22:28 NLT, Deut. 19:14 and 27:17). Boundaries help define us, it makes a distinction between “me” and “you” and “mine” and “yours,” it stops abuse, it prevents offenses and resentments from building up, and it encourages mutual respect. In effect, it promotes peace and strengthens relationships–not just in context of land, but also within relationships. 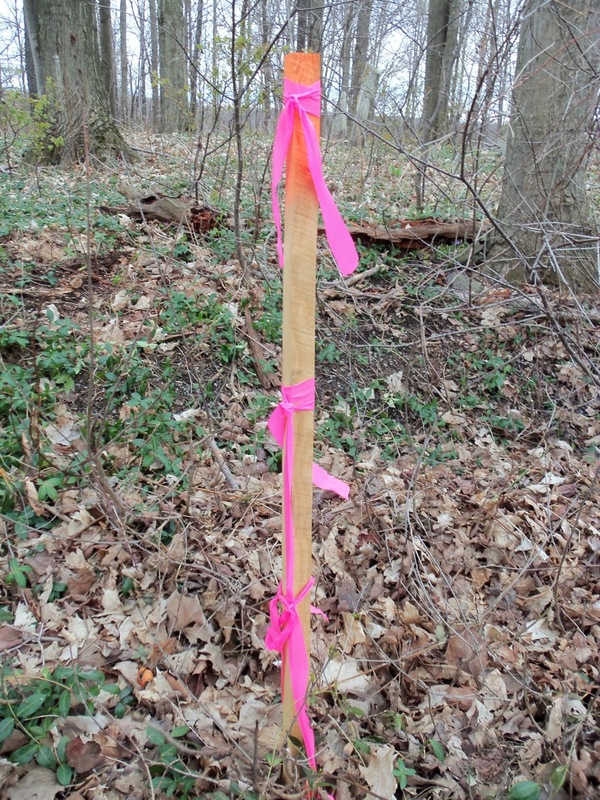 One person can move another person’s personal boundary markers just as much as a boundary marker for land. This makes great sense. I can relate to the neighbor thing. Ours on most sides seem to claim our land by mowing a little more of it each summer. I did deal with the one, some day I need to take charge of the other. I really do not think Danny is a wimp. I think he’s getting old and the hill is so steep that he doesn’t always feel that he can manage it. That’s ok…I’m glad he knows his limits. His passive resistance–grinning, wagging his tail, but refusing to comply–makes me laugh and I like to tease him a bit. I do think that people tend to push boundaries a bit, and take a little here and there–like Lucindaline’s neighbors. I don’t think it’s ever easy to set boundaries, at least for me, but there comes a point when we have to or we have nothing left. And often it’s easier to set the boundary at the beginning than to try to regain lost ground. I think boundaries are actually being honest–like saying I don’t feel well enough to tour the garden. It’s clearly defining the boundaries–like “this far and no further” or I refuse to tolerate insults. Once we honestly define the boundaries and enforce them, I think many people will respect them and not violate them, which is healthy for the relationship. Some people will not respect the boundaries, will get angry that they were set, and the relationship may die. However, people who do not respect the boundaries of others are toxic and not true friends. Although the loss of friendships saddens me, I no longer want toxic people in my life.